Until Spectre came along, The Man with the Golden Gun was the only James Bond film in which Bond wears an ivory dinner jacket as his sole dinner jacket. However, it could not take the place of Bond’s number one look: a dark midnight blue or black dinner suit. For uses outside the frames of the film, Roger Moore’s tailor Cyril Castle made him a black wool and mohair-blend dinner double-breasted suit in a style similar to his other suits in The Man with the Golden Gun. Moore wears this jacket in promotional photography for the film, giving him the ultimate James Bond look. Beyond the promotional stills, Roger Moore also wore this dinner suit to the premiere of The Man with the Golden Gun at the Odeon Leicester Square in London on the 18th of December 1974. 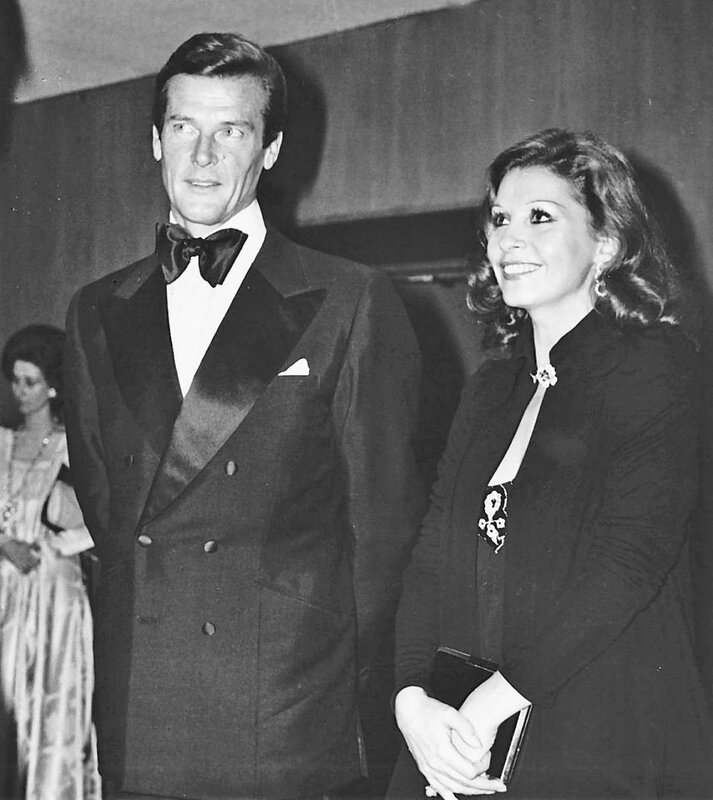 Roger Moore often wore his dinner suits from his Bond films to their respective premieres, but a London premiere, especially in December, is not the place for the ivory silk dinner jacket. Moore luckily had a fresh option to wear to this premiere and did not need to re-wear his more flamboyant dinner suit that featured in Live and Let Die stills and that film’s premiere. It is possible that this suit could have been made as an alternative for any number of scenes in The Man with the Golden Gun. 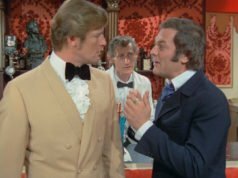 The mannequin in Scaramanga’s funhouse would have looked even more the part of James Bond if it were dressed in a black dinner suit rather than a black suit. Other scenes could have been written to feature Bond black tie. If the nightclub in Beirut where Bond watches Saida dance were more formal, a dinner jacket could have been appropriate there. But in that case, the ivory silk dinner jacket from later in the film would have been a better option than the black dinner suit and the black dinner suit could have made an appearance for dinner with Hai Fat instead to avoid repetition. If the Macau casino were more formal and Bond visited at night, he could have worn a dinner suit like Bond does in a Macau casino in Skyfall instead of his grey silk suit. If Bond’s dinner with Goodnight were set more formally, the dinner suit could have been an option for that scene instead of the charcoal herringbone suit. The Bottoms Up club would likely never have been a fancy enough venue for black tie. 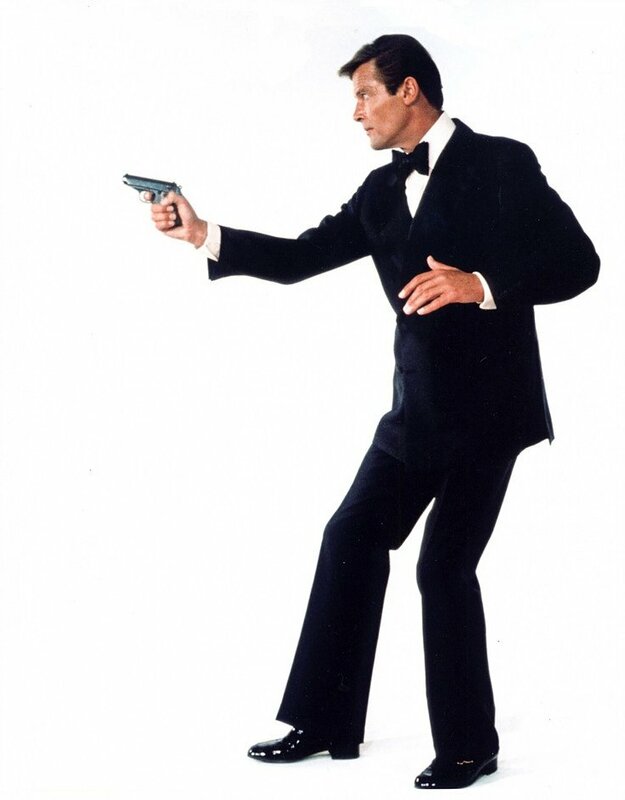 Because many other James Bond films feature multiple black tie scenes, a second black tie scene could have been written—or shoehorned—into The Man with the Golden Gun to feature this black dinner suit. But with all the silliness present in this film, the writers may have felt another black tie scene a step too far. 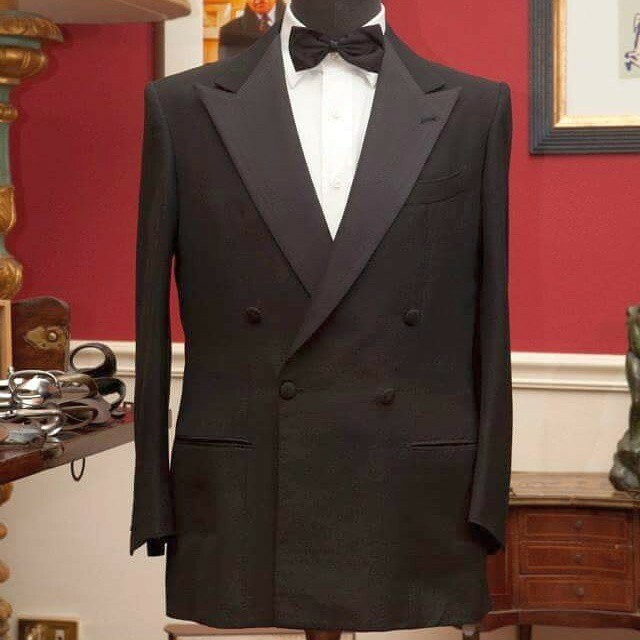 This double-breasted dinner jacket is made in the classic button two, show three style (6 on 2) with a narrow wrap and has wide black satin-silk-faced peaked lapels cut with belly. The buttons are covered in black satin silk. The jacket has the same cut and style as Cyril Castle’s other suits’ jackets in the film, with soft shoulders and gently roped sleeve heads, a full chest with an extended front dart, and deep double vents that start almost as high as the waist. The jacket is detailed with slanted jetted pockets and flared link-button cuffs. The dinner suit’s trousers have a flared leg and black satin silk stripes down the outseams. The top of the trousers is not seen, but they are likely the same style as Moore’s other Cyril Castle trousers with a darted front, pockets at the bottom of the waistband and two rear pockets. Moore wears the same shirt with this dinner suit that he wears with the cream dinner jacket in the film. The shirt, made by Moore’s usual shirtmaker Frank Foster, is made of cream silk crepe de chine and has a very high spread collar, a pleated front with mother-of-pearl buttons down the placket and two-button cocktail cuffs. The placket is stitched close to the centre to give focus to the middle of the shirt and to make the width of each side of the placket from the stitching the same width as the pleats. 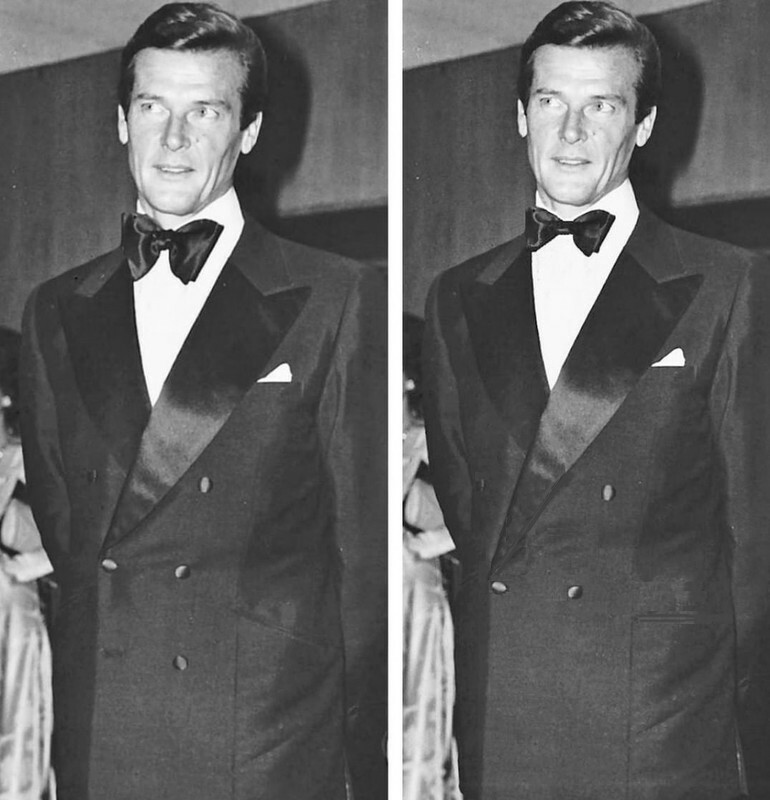 The bow tie in the stills is the same wide black satin silk butterfly bow tie that Moore wears with the ivory dinner jacket in the film. The bow tie at the premiere is even wider and could be the same wide bow tie that Moore wore to the Live and Let Die premiere. At the Golden Gun premiere Moore also wears a white pocket square tucked into his jacket’s welt breast pocket. In the promotional stills we can see Moore’s black patent leather Gucci loafers, which have an apron toe, a strap and side bit detail and tall heels. These shoes, despite being in patent leather, are a non-traditional style for black tie, with the apron toe being the most significant offender. A plain-toe slip-on is a better non-traditional shoe for black tie because it more closely resembles the traditional pump. I feel like I should say that the slanted pockets and flared trousers are the things make this suit too sporty for my taste, but even then I can’t help but appreciate these details as being fun but not being too ostentatious. I honestly can’t tell you why that is, everything in me tells me I should hate it. This is such a classic Moore suit, and he looks very much at home in it. The ’70s were made for him. It may just be a trick of the light reflecting off domed satin buttons, but it looks like the buttons on the suit are pointed ovals, instead of round (football shaped for those of us in North America). Whether or not these buttons are shaped like that, I’ve noticed that some makers will use oddly shaped buttons for formal jackets. Is there a reason for this, beyond simply adding a bit of nonstandard flair that still fits within the bounds of the dress code? The classic is about proportions. Nice Photoshop! As a 4×1, the button stance would need to be lowered and the straight jetted pockets also need to be lower than the top of slanted pockets to look more balanced. The button stance only needs to be a hair lower for the 4×1 to look balanced. This is the better that i can. This looks much better. The only problem is that it is much more difficult to get this kind of close fit at the waist with the fastening button below it, especially when you have the extra fabric in a double-breasted jacket. I understand. Just so we’re clear though, do you dislike the 6 on 2 fastening of Roger Moore’s and think it would be improved by being 4 on 1 instead? Nothing says rental like patent leather …. Nothing says classic black tie like patent leather. These shoes are not a classic style, but patent leather was a must for black tie until recently. Calf shoes would not have been an option for Bond in the 1970s. Why do you think the transition to high polished calf shoes occurred? Is it because of the whole downplay formality era we are in? I actually got that notion from GQ magazine. (I know I know, it’s like trying to diagnose yourself using wikipedia). Patent leather remains a correct choice for black tie, but many menswear enthusiasts simply prefer the low profile of calf leather. Those uncomfortable, synthetic patent leather shoes are what many associate with rentals. GQ has given a lot of conflicting advice over the years depending on what’s in fashion and the preferences of its writers — sometimes even within the same issue, I’ve noticed. Perhaps there is a practical component. I only have occasion to wear black tie once, sometimes twice, in a given year. It’s difficult for me to justify owning a pair of shoes that would be worn so infrequently when my usual cap toe oxfords will do the job almost as well. In a perfect world such considerations would not be necessary, but alas. Roger looks great, wearing this restrained 70’s style with his usual style and class. Thanks for covering this lost gem of a dinner suit. It is probably best, however, they did not find some strained way to include it into the film. 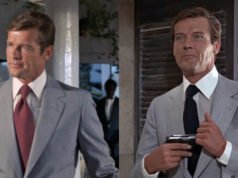 However, thanks to this blog and some of my fellow regulars, my opinion of Golden Gun’s wardrobe has shifted over the years as it includes great tailoring and a couple of my favorite suits of the 1970s. This dinner suit fits in nicely with them. Golden Gun has by far my favorite 1970’s Bond wardrobe, and it’s rather high on my list of favorite clothes-movie of the entire series. Even if it’s a weaker film overall, Roger never looked better!